"Leading a squad of Company L, he gallantly cleared the way for his company's approach along a ridge toward its objective, the Casoni di Remagna. When his platoon was pinned down by heavy fire from enemy mortars, machine guns, machine pistols and rifles, he climbed in advance of his squad on a maneuver around the left flank to locate and eliminate the enemy gun positions. Undeterred by deadly fire that ricocheted off the barren rocky hillside, he crept to the rear of the first machine gun and charged, firing his sub-machine gun. In this surprise attack he captured 8 prisoners and turned them over to his squad before striking out alone for a second machine gun. Discovered in his advance and subjected to direct fire from the hostile weapon, he leaped to his feet and ran forward, weaving and crouching, pouring automatic fire into the emplacement that killed 4 of its defenders and forced the surrender of a lone survivor. He again moved forward through heavy fire to attack a third machine gun. When close to the emplacement, he closed with a nerve-shattering shout and burst of fire. Paralyzed by his whirlwind attack, all 4 gunners immediately surrendered. Once more advancing aggressively in the face of a thoroughly alerted enemy, he approached a point of high ground occupied by 2 machine guns which were firing on his company on the slope below. Charging the first of these weapons, he killed 4 of the crew and captured 3 more. The 6 defenders of the adjacent position, cowed by the savagery of his assault, immediately gave up. By his l-man attack, heroically and voluntarily undertaken in the face of tremendous risks, Sgt. Karaberis captured 5 enemy machine gun positions, killed 8 Germans, took 22 prisoners, cleared the ridge leading to his company's objective, and drove a deep wedge into the enemy line, making it possible for his battalion to occupy important, commanding ground." Taken from the Sgt. 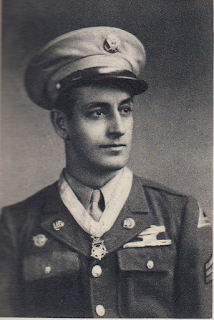 's Medal of Honor citation, awarded on November 1, 1945.